Like many of you, our December has brought more obligations and commitments than usual for us. As a result, my sewing machine has been collecting more dust than I'd like. While sitting down to sew this weekend, I realized how even when life gets busy, I feel more centered and energized when I carve out some time for sewing. In past years and especially when our family was smaller, I really strove to keep our Christmases largely handmade. And while that sounds lovely, and it really was, it created so much work for me. That was fine when I enjoyed it, but as the years went by, my mile long 'to make' list just made me feel overwhelmed, pressured and stressed out. So this year, I've whittled down my sewing to-make list to Christmas Eve pajamas. I hope I've found my sweet spot with this goal. Just enough sewing to nurture my creative center and give my kids something handmade this Christmas, while still leaving plenty of time for all of the other things we'd like to do this month. I started with a nightgown for Iris. Dan and I sometimes joke that Iris looks like the Littlest Who in Whoville. 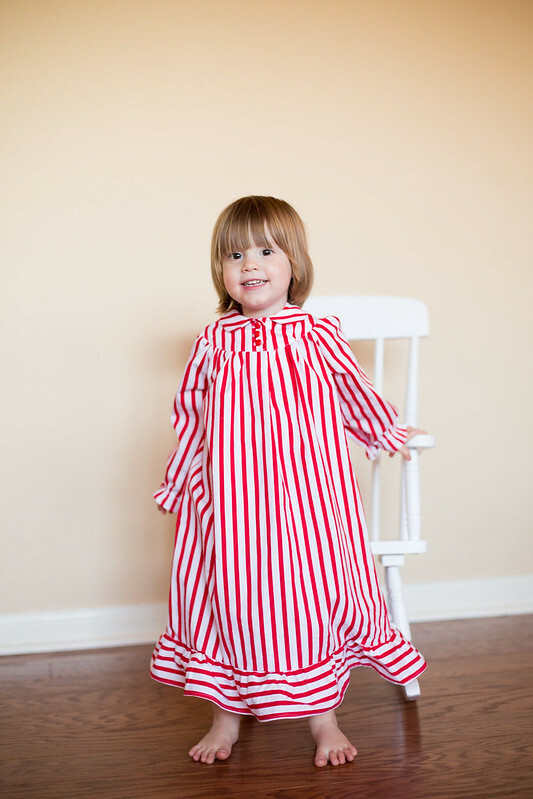 So what could be more fitting for our Cindy Lou Who than a 1950's red and white striped nightgown? The pattern, Butterick 8247, inaugurated me into the world of vintage sewing. If two pattern pieces needed to be taped together, each was properly labeled, in perfect penmanship (cursive, naturally). I even found a little girl's wrist measurement penciled in next to the instructions on cutting the elastic for the wrist casing. I could tell based on the way the ruffle piece was cut out that the original owner cut the ruffle in the same way that I did. I cut it in one long strip rather than three, which had to later be sewn together. We both wanted to save a little time. It was an awesome experience to use a pattern owned by someone who so lovingly poured over every detail and took such care to preserve the pattern over the years. I found myself wondering, if even daydreaming, about her story. 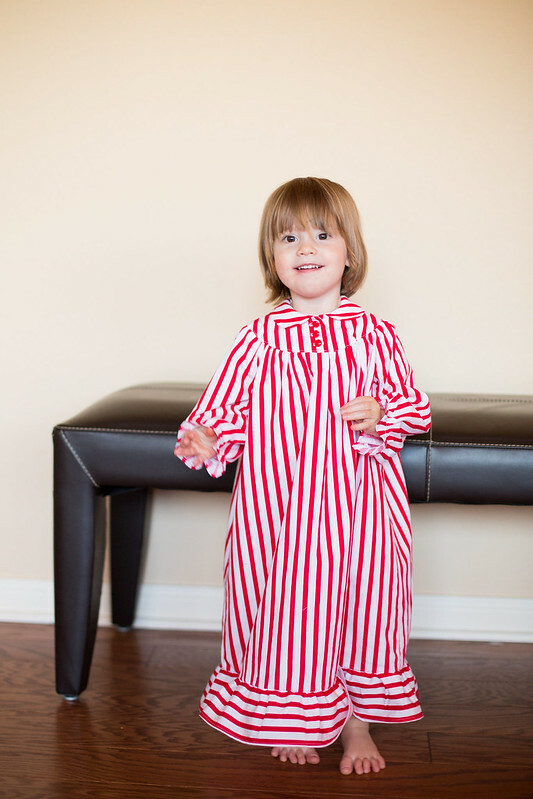 With one nightgown done, my Christmas to-make list is now 25% shorter. Which leaves me wondering if I might even have time to eke out a Christmas dress for Indigo. We are on our homeschool winter break, after all. We'll see if that fits within my sewing sweet spot. What a fun nightgown this is, Rachel! 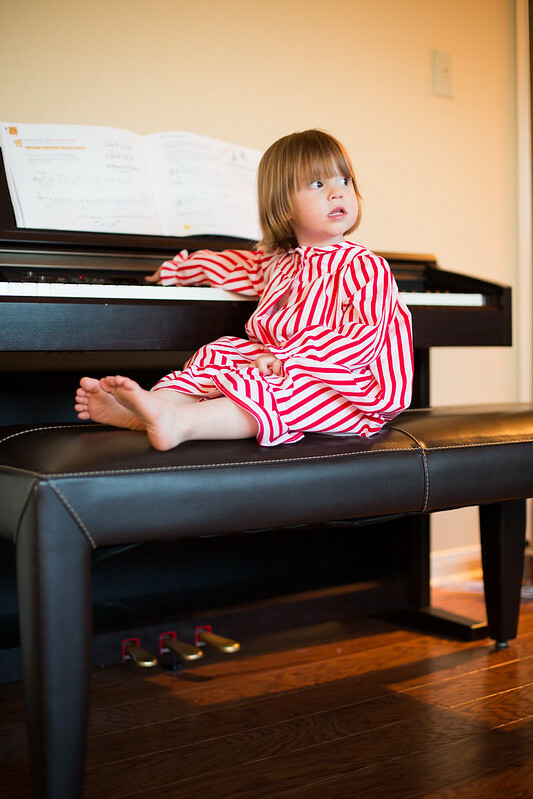 I love the mix of the vintage pattern with the bold striped fabric. thanks, marta! have you considered etsy? you might be able to find some vintage patterns there. Eep! So cute! I would love to have a little Cindy Lou Who running around - how adorable and Christmasy! I have several vintage patterns that have been lovingly used and carefully folded back up into the envelope, with a nicely cursived name on the front. I think, dear me, what will people think when they see my used patterns? "Wow. This lady was a hot mess!" or, if I'm really lucky, "Her handwriting is completely illegible. She must have been a doctor or lawyer." I love love love this nightgown. What an adorable tribute to your foremother/grandmother/auntie in sewing. I wish I could see what hers looked like! So cute. She looks like a giant boiled sweet! My sewing machine has been collecting a lot of dust too. I was hoping that this break from school meant that I would be able to sew up a storm, but every weekend is full of parties and get togethers and now this weekend my mother-in-law arrives for her three week stay - which happens to be in my sewing room. Needless to say, I don’t think I’ll be getting much sewing done in the next couple of weeks. Oh well. 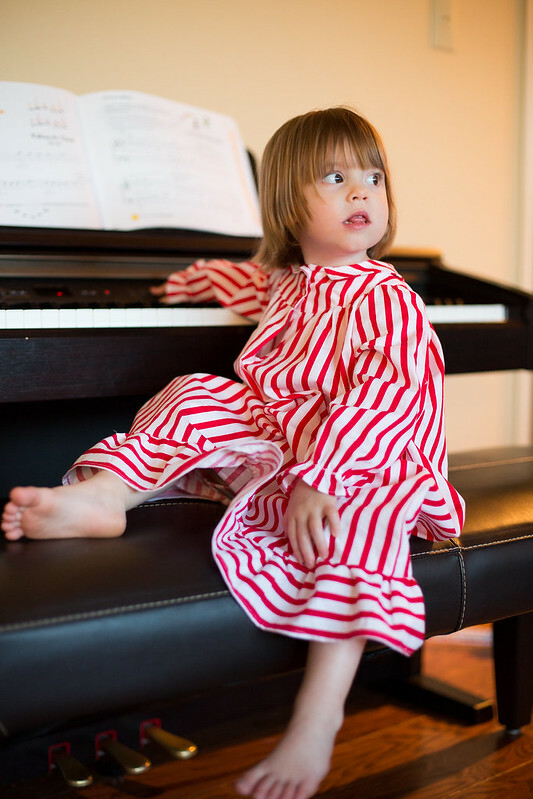 On a much brighter note - my goodness that is a super cute and sweet nightgown! Iris just looks adorable in it! Most definitely the cutest Who is Whoville! Vintage patterns have always scared me….perhaps I need to get over that fear. Oh, these are adorable! And I have out a few too many items on my handmade for Christmas list. I just enjoy it so much (for now)! I just finished sewing a robe from a vintage pattern and the pieces were all cut out as well. So nice to save a step! She is just so adorable! 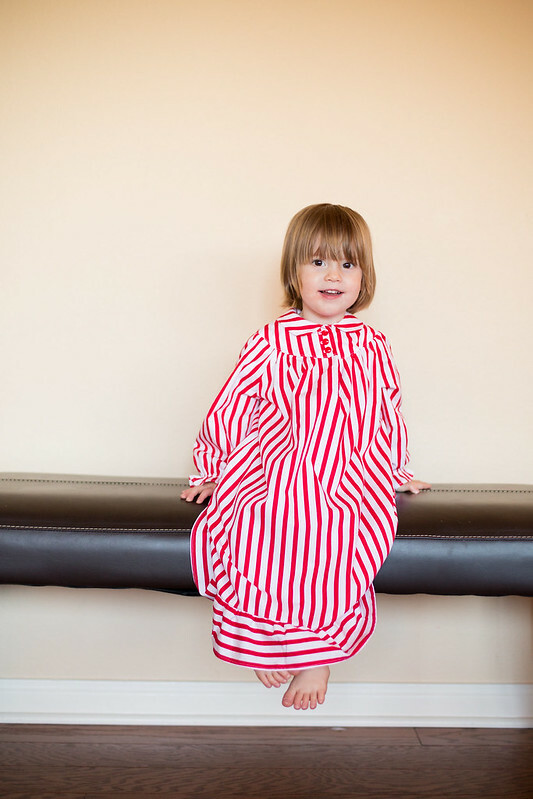 I love the stripes and bold red! I've whittled my Christmas expectations down to a single hand made gift, and this year it was only the girls that got one. I'm happy to see you got all the pjs made!